This award-winning boutique hotel offers elegant rooms, a chic waterside brasserie, stylish champagne bar and cosy lounges. 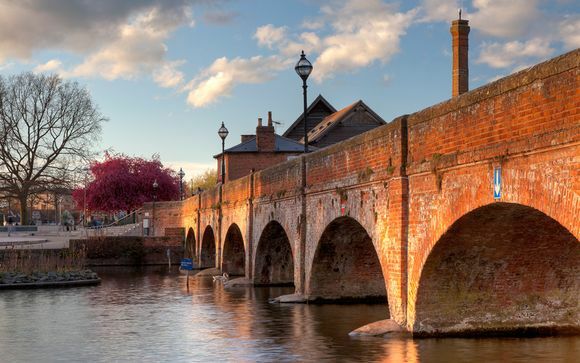 It is located in the heart of historic Stratford-upon-Avon, opposite the world-renowned Royal Shakespeare Company theatre, with views across the River Avon. Stratford upon Avon, a thriving market town on the banks of the beautiful River Avon is best known as the birthplace of William Shakespeare. It is one of England’s most historic and beautiful destinations. Situated in the heart of Stratford, The Arden Hotel is on the doorstep of some of the country's most enduring attractions, and within easy driving distance of London. The Royal Shakespeare Company and the many historical sites of Shakespeare's Stratford-upon-Avon are just moments away while Warwick and Kenilworth castles, The Cotswolds and Compton Verney are all within easy reach. Winners of the ‘Small Hotel Group of the Year’ category at the AA Hospitality Awards, The Arden offers sophisticated boutique design, a fantastic waterside location and a cosy, welcoming atmosphere. Bedrooms are elegantly furnished in typical Manor House style, and most enjoy views over the magnificent Royal Shakespeare Theatres or the River Avon. Great food is a big feature here - try the seasonal local produce. transformed into refined restaurant dishes, sip on some bubbles at the waterside Champagne Bar, or indulge in the decadent Afternoon Tea, enjoyed by the fire in the cosy Lounge. A calm, relaxed air pervades, with soft pastel colours and striking artwork giving an atmosphere of comfortable modernity. The rooms are spacious with a light, airy feel, some with stunning views of the grounds, RSC and River Avon. - Superior Room (30m² / max. 2 persons): Each room is furnished in a contemporary style with soothing pastel colour walls that are complimented by bold artwork and vibrant splashes of colour. - Deluxe Room (30m² / max. 2 persons): Make yourself at home in your generously proportioned deluxe room. Pop the kettle on and relax in a deep armchair while flicking through a guide to the wealth of attractions Stratford and its environs have to offer. 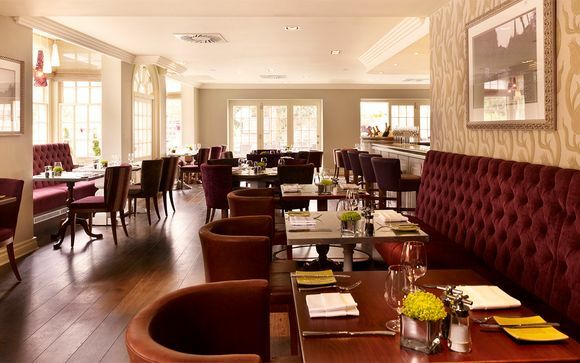 Setting the bar for dining in Stratford-upon-Avon, The Arden Hotel offers an exceptional culinary experience in stylish surroundings. The Waterside Brasserie has been awarded 2 AA Rosettes in honour of the mouth-watering dishes using only the best seasonal local ingredients which are served throughout the year. This bar also offers guests a relaxed dining experience in a chic environment, complete with its own Champagne Bar and beautiful interiors. A modern take on the old fashioned gentleman’s club, the Club Bar is open from morning coffee right through to late night drinks. Adorned with evocative shots of famous performances from the Royal Shakespeare Company archives, and fitted with an ornate carved and gilded bar, The Club Bar oozes theatricality, invoking the time-honoured pedigree of the world-famous theatre company. In warmer months, the private terrace offers an ideal perch for people watching with excellent views over Waterside and the River Avon. Serving a selection of delicious simple snacks, tempting treats, afternoon teas, freshly brewed coffee and drinks. This is a great place to start or end your day. Sink into the comfortable sofas next to the feature fireplace and just relax. Your hotel is approximately 10min / 1.5km from Stratford-Upon-Avon Station.